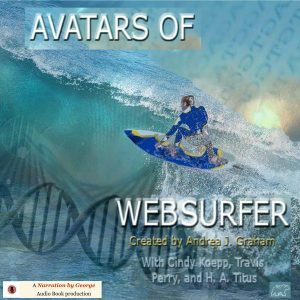 Avatars of Web-Surfer (Web-Surfer Series) | Narration by George! In the 22nd Century, most of the world’s computers are controlled by an Artificial Intelligence; an AI who is more than a machine. Alexander McGregor is just an infant when his father converts his cells into biological supercomputer components, and called him Sander. Sander is enslaved to his code as he serves a billion users worldwide; users he appears to as separate avatars of himself. Each avatar has its own personality, but all of themare linked together in a shared mind. He reigns over most of Earth’s computers in a global society where tech-dependency can kill. Freedom calls Sander like a siren. His answer could shake the Earth. Come. See the rise and fall of the AI man in these 10 episodes. Each features a different AI user.